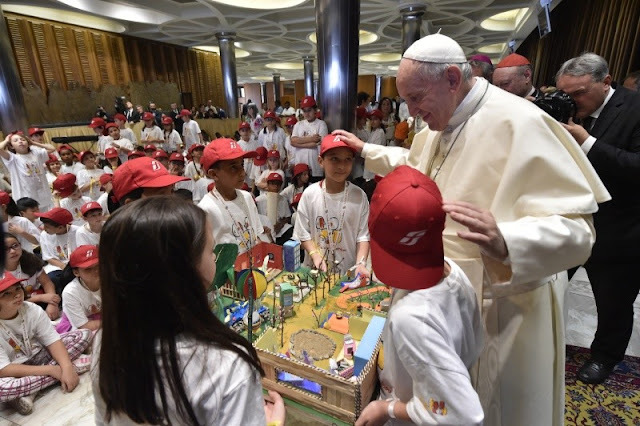 Catholic News World : Pope Francis Q and A with Children "I felt in my heart that I had to become a priest"
Pope Francis Q and A with Children "I felt in my heart that I had to become a priest"
Your Holiness, I am Milena Sozzi, I am the director of the "Tommaso Grossi" Comprehensive Institute, Molise-Calvairate district, east of Milan. Good morning Holiness, I'm Micaela Francisetti, I'm the manager of the Comprehensive Institute "Ilaria Alpi", south-west area, Barona district. Good morning Holiness, I am Milena Piscozzo, dean of the Comprehensive Institute "Riccardo Massa", north-west of the city. And as leaders of four schools in the suburbs of Milan, rather than talking to us executives and explain what they want children and how our neighborhood, as are our neighborhoods, our children have prepared several surprises and tell how is the neighborhood, even with materials and products that they have made, and important surprises just for you. Your Holiness, allow me to call you dear Pope Francis, thanks for this unrepeatable occasion and the enthusiasm you see in the eyes of our little ones. I am Rosa Maria ..., head teacher of a Comprehensive Institute of the Prenestino-Collatino of Rome, "Giovambattista Valente", a school in the suburbs so dear to you. Our users are very colorful, very varied, made up of many ethnic groups, Roma pupils, foreigners, because the school has been working for years for inclusion and participating in this project has allowed us to think, to imagine a very colorful territory, like the our school community. So, I leave room for our students who will show them the work between which there is the interweaving of colored threads that represent what you work together, joined in a very strong and I conclude, if you allow me, using the words that You address the Church in your reflection [Apostolic Exhortation] Evangelii gaudium, I would like to readjust to the school, saying that we prefer a school that gets dirty in the streets rather than a school that remains clean in its closure. Thank you. Pope Francis, good morning. As you wish from the window on Sunday tells us "good appetite", we also say "hello", today. I speak for the "Antonio Gramsci" Comprehensive Institute, located on the outskirts of Rome, at Trullo, an area particularly affected by the integration and the ability to welcome our children and our families. There are 1,100 children, 1,100 families who have become a family, a single family with open arms to welcome anyone who wants to arrive in our territory. The school works for this. My name is Anna Greta and I am from the school in via Giacosa. I wanted to ask you a question: do you remember how your teachers were? I went to school when I was 6, the school was 400 meters from home, I went on foot, and I went there in the year '42 ... Where were you alive in the year '42? ... Eh, not you I was! The teacher was called Stella, a teacher I had in the first year and in the third, the same teacher. In the second and fourth I had another one. She was good, taught us to write and read, very good. Then, always, when I left the school, I always remembered, because remembering the first teacher or the first teacher is very important because it is the one that makes you go in life first. And I called her on the phone, already as a boy, already as a priest. And then as a bishop I helped her in her illness. She died at 94. And I always followed her. I never forget that memory. Thanks for the question! Good morning, my name is Clara and I would like to ask you: when you were a child, what was your neighborhood and what city did you live in? Thank you. Can I afford something? I lived in the most beautiful city in the world! In Buenos Aires, in the district of Flores, which is one of the oldest neighborhoods in the city, of the first districts. And I lived with my family, we were five brothers at home ... and the neighborhood is a popular neighborhood, there were no tall buildings, no, they were all low houses. At that time, there were very few high-rise buildings. They came after the tall buildings ... It was a simple neighborhood, and thirty meters from our house there is a beautiful square where we played football. I was a goalkeeper. Do you know why I was a doorman? Because I was a "hard pata", "hard leg" to play. What does it mean? That I was not a great player and because of this, because I did not know how to move well, they put me there as a goalkeeper and I managed to do it well! Thank you. My name is Malak, and I wanted to ask you how did you understand that you had to live the life you lived and how you lived this life. 4 years as a chemist. And while I was studying, at the end of my career, I worked in a laboratory, and I liked that. But at a certain point I realized that it did not fill me so much, and I thought: we have to do something for the others, the doctor ... these things. And in the end one day, the first day of spring in Argentina, on September 21st - which is the opposite of your September 21st, which is the first day of autumn - I felt in my heart that I had to become a priest: boom, a blow. And then I continued to work for a few years, but this certainty was always maintained, and then I entered the seminary. But it was suddenly that I heard it. Thank you. GIULIA VITALE I am Giulia Vitale and I come from the "Ilaria Alpi" Comprehensive Institute. I would like to ask you what your school was like. My school was in the street called "Arella", it was a street of low houses; the school was all with a red brick facade ... And on the left there was a beautiful green square, but there you could not play football because it was all green with plants ... beautiful. The house was 400 meters away, I always went on foot. A beautiful experience, I remember a 25 May ... In May the strong autumn begins in Argentina, there is already a strong autumn. But that year it was very cold in the fall and I went to school for a patriotic ceremony, because May 25 is the feast of our homeland. And when I came out I saw ice for the first time. At that time there was ice, today with the heating the ice almost can not be seen in the city, but in my time ... At home there was a simple heating, a single stove for the whole house, it was a very simple thing, and there was ice on the way to school. Then the school: we entered and there was a large, a large place where we all gathered and we also did a little 'party between a lesson and another, and the classrooms where they did the lessons were all around. And there it was an hour of school and 10 minutes of recreation in this garden. This is the school. Beautiful. And I went there a few years ago because there was a remembrance party for the first director of that school, which I did not know, was before me. And when I entered the school it was just like my time, the same, and this touched my heart, I loved it. Thank you. EIMAN My name is Eiman. What were your favorite games when you were a child? POPE FRANCIS We played a lot with the kite. We did it with rods and paper, light paper. We did it. Then the thread ... It's the game we liked the most. We liked football so much. We also did a football league, all the guys in the neighborhood; and also a championship of kite, the one that carried the most beautiful and the one that went higher. And we played like that. Then, in the carnival, we did the carnival procession. All disguised, but in many things, everyone disguises himself as he wanted and we went on the street singing and even playing in the houses singing, and then asking for something to buy chocolates, our things ... The carnival was beautiful at that time, by us. And then in the evening we would go to the biggest street in the neighborhood, which was 600 meters from the house, and there was a big parade of the carnival, the whole neighborhood, and there were big and small; on the other hand, we were doing it inside the neighborhood ... These are the games we did. JACOPO My name is Jacopo, I have to ask you: how did you feel when they chose you as Pope? POPE FRANCIS This question is not original, everyone asks it! Here is the Cardinal [Ravasi] who was present at that time ... I heard that the Lord wanted me to work here ... and I said: "Come on" ... I felt peace, this is the word, and it is not a lie I felt peace until today. POPE FRANCIS Thank you, this is your job? SCHOLASTIC DIRECTOR Thank you, holiness. We ask you to pray for us. The whole school asked for prayers and his great blessing. Thank you. [SONG] DIRECTOR OF SCHOOL Children have reinvented the words of an Italian song of several years ago that is "The boy of the street Gluck", Milan, so in this summary we can join together and sing it now. [SONG] DIRECTOR OF SCHOOL As a testimony of the great work our children and girls have done, we have some gifts brought from Milan, in particular we have taken three dimensions of the work they have done with their heads and their hands, a plastic representing their neighborhood and our beautiful school in a park. Along with this beautiful model also a couple of other gifts that I believe the teachers have nearby. Now I ask our children and our teachers to move our gift because they come from other schools. SCHOOL DIRECTOR I ask the "Riccardo Massa" to prepare with the model and the gifts for His Holiness ... Your Holiness, this is the model of the Gallaratese district of Milan. SCHOOL EXECUTIVE Plastico of the Comprehensive Institute "Ilaria Alpi" and the breads offered by mothers of all the ethnic groups and of all the cultures that are present in our school. SCIENTIFIC DIRECTOR Plastic of the "Tommaso Grossi" Institute in Milan, and the children with the gifts of the school in via Monte Velino. SCHOOL DIRECTOR From the "Gramsci" school in Rome, the model and the drawings. SCHOLASTIC DIRECTOR The "Giovambattista Valente" school in Rome. [SONGS] WORDS IN THE POPE'S ARM Thank you so much for the questions and for the gifts that have been made by you. These things are wonderful, because you did not go to buy something to bring, but you did it! I got it? And this is important, because you did it with intelligence, with your hands, but also with your heart. And when something is done with the three things, with intelligence, with the heart and with the hands, it is a profound and human thing. How should we do things? With what? Let's say it together: [the children repeat] the intelligence, the heart and the hands. I will only say one little thing, one little thing, I will ask you one last question and I leave and leave you quiet. Agree? ["No!"] Ah no? Do not you want to be quiet? It is something that I take from one of the questions you asked me: if I remembered the first teacher and the school. Never forget the first teachers, never forget the school. Because? Feel good. Because they are the roots of your culture. But what does the roots mean? I will give you an example. Answer this question. A tree, to which the roots have been removed, can it give flowers? ["No!"] Safe? ["Yes!"] A tree without roots can not give flowers, and we as people also have roots? Yes, spiritual roots, the home, the family, the school. This is why I tell you: do not forget about school because they are the roots of your culture. And if a child, a child, a boy, a girl forgets about school, can it bear fruit in life? ["No!"] No! Can a boy, a girl without roots, bear fruit in life? ["No!"] And can you give flowers? No! The roots. I will teach you a word that means what you must never be. Listen well and learn: "I must not be uprooted." Did you learn it? "Uprooted". What does it mean uprooted? Without roots. I must not be uprooted, that is without roots. And for this reason to remember the school, the teachers, always in life will help us to keep our roots, to bring flowers and fruits. This is the thing I wanted to tell you. I thank you, thank you very much for this nice meeting. It's all your work. And now I will tell you: I have been with you for four years, every year the children come, the boys with the train, and thanks to the train that gives us the train, thank you, thank you very much! Always ask me questions, boys, girls, children, girls ask me questions. Do you know what was the most interesting question I heard? POPE FRANCIS This is very interesting. But there was one more interesting ... Do you want me to say it? Everyone was asking good questions, but by now, towards the end, someone who was standing in front of me said: "What time do they give you lunch?". [laughs, laugh] I wish you a good lunch. The Lord bless you! I embrace you all. Hello!